Nearly 49,000 participating Dupaco Community Credit Union members will receive their share of more than $3.17 million as part of the credit union’s nine-month Thank Use initiative. The member payout will coincide with International Credit Union Day on Thursday, Oct. 19. The 2017 initiative, which began in January and concluded Sept. 30, was a way to demonstrate the power of Dupaco’s member-owned, cooperative structure, according to Dupaco Chief Marketing Officer David Klavitter. Members with an active checking account were rewarded in relation to their participation in their credit union. By using their financial cooperative’s services—loans, savings, e-statements and credit and debit cards—eligible members boosted their financial well-being and earned Thank Use cash. Members also worked together and reached a group swipe goal by using their Dupaco debit and credit cards 12.5 million times, unlocking up to $40 more for individual eligible members. 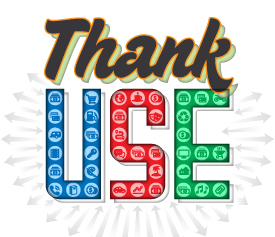 Thank Use is getting recognized nationally for its impact on credit union members. Dupaco received “Best of Show” for the initiative by the CUNA Operations & Member Experience Council during its annual conference Oct. 2 in Phoenix. The council’s Excellence Awards recognize innovative solutions that optimize credit union performance. While Thank Use has ended, Dupaco continuously seeks to enhance value for its 100,000-plus members. The cooperative achieves this in a variety of ways, including product, service and technology enhancements; branch convenience; staff expertise and service; higher savings rates; lower loan rates and fees; and more. so happy for the deposit in our account! thank you for the bonus date night!! !